The key takeaway is as a FuelBand purchaser I am eligible to a $15 refund or $25 gift card from Nike. As if on cue my FuelBand died the next morning. It stopped holding a charge. Dead. I brought it into NikeTown. They tried to charge it up. Nothing. I filed my claim and tonight I tossed the FuelBand and its box. It was the quiet end to a 3 year saga of a should-have-been-better product that overpromised and underdelivered. I got my first FuelBand a few months into the early hype. All the cool kids had them and it seemed everyone else wanted one. It looked pretty sharp and it was the next generation of fitness tracking. I had to have it. First, let’s step back to the dark ages. I tracked my workouts long before there were apps, GPS and wearables. It was simple. I used a sports watch and wrote my results in a composition notebook. It was important to see how long I ran, how far I biked and if I improved. I even tracked how much time I actually spent skiing in an eight hour day on the slopes (it’s about two hours, kids). The data was valuable in many ways. I could train smarter and get better results by keeping good records of every workout. Now, some would ask why I even need a wearable at all when I can use any of dozens of running and fitness tracking apps on my phone. Well, I used to wear my a fitness armband with my old phone, but the iPhone 6+ would be something akin to strapping a cookie sheet or personal pan pizza to my arm. I saw someone running with one tonight and it looked silly. Plus, I love the minimalism of running. Shoes, shorts, shirt and socks. A fitness tracker on my wrist keeps it simple. 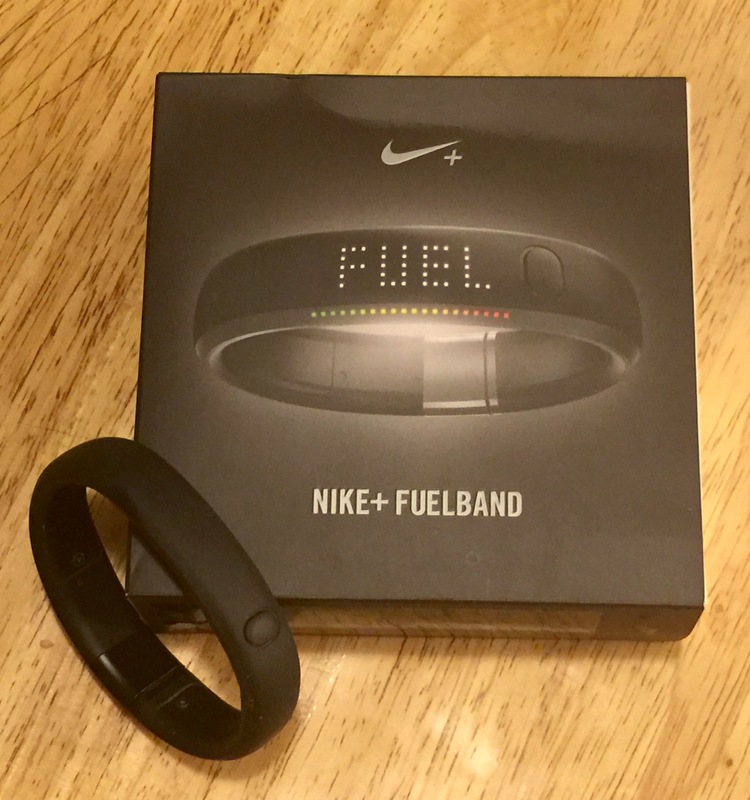 Once I got my FuelBand I was puzzled about Fuel Points. What did they mean and how much exertion would it require to earn them? I would often earn more points driving my kid to school than I would on a three mile walk. Biking didn’t seem to earn that many either. The only real high scorer was running. However, I accepted the opaque and arbitrary Fuel Point and settled on getting 3000 a day. If I succeeded it signaled to me that I wasn’t just a waste of flesh, fat and bones. I had done something. However, the real problem with the FuelBand was simple. It was poorly made. My first band broke down within a few months. Nike gladly replaced it. Number two last for an even shorter period. Replaced again. Three made it nine months. Replaced. Four managed to hang on long enough to hear the class-action judgment and shuffled off its electronic coil. My kids’ goldfish lasted longer. They fell apart, they stopped holding a charge, they just died. The folks at Nike were always helpful and swapped them out without hassle, but you always got the feeling they knew it was a crappy product. My forthcoming $25 gift card bears out my suspicion. So today as I mourn FuelBand IV I ponder our legacy of three years together. What kind of elegy can I compose over a poorly made piece of dead electronics? I will keep it short and mostly sentiment free. FuelBand, you and your 3 older brothers served me adequately for the past three years. You tracked my movement and let me know whether I had completely wasted my day. You were too fragile for this harsh world. We didn’t share the same language. I talked in distance, time and calories burned. You spoke in FuelPoints. We may never have entirely understood one another, but we made it work. May you rust quickly in the great landfill in the sky. I won’t miss your poor syncing abilities, but I will cherish my 3,000,000 FuelPoints. Farewell, old chum. So Much Promise, But Will It Deliver? As I pitched my FuelBand IV, I was busy setting up my new Fitbit Charge HR. Once NikeTown confirmed that FB4 was indeed dead, I ordered a new wearable. Five days of data will go untracked, lost forever, but I go forward knowing that I have taken 55 steps since midnight, my heart rate is 64 and in 26 minutes I’ve burned 46 calories. Goodbye and Godspeed FuelBand. Hello Fitbit. Let’s get to tracking.